KIEV, Ukraine -- On the 24th anniversary of the world's worst atomic accident, Ukraine's president warned Monday that a reactor at Chernobyl remains a serious threat to Europe. A relative of Klavdia Luzganova, who died when a reactor at the Chernobyl nuclear plant exploded on April 26, 1986, mourns over her grave Monday at Mitino cemetery in Moscow. Health groups estimate that radiation from the explosion has caused more than 700,000 premature deaths. The 1986 explosion of reactor No. 4 sent a cloud of radiation over much of Europe, and severe health problems persist. President Viktor Yanukovych says about 2 million people have illnesses caused by the radiation, and non-governmental organizations estimate the disaster has caused more than 700,000 early deaths. During commemoration ceremonies Monday, Yanukovych said the reactor is a threat "not only for Ukraine, but for Europe, Russia and Belarus." The radiation left swaths of Ukraine and Belarus uninhabitable. Both countries were part of the Soviet Union at the time of the explosion. Yanukovych laid flowers at a monument to explosion victims in Chernobyl and visited a plant that reprocesses spent nuclear fuel. Yanukovych pledged to provide better care for Chernobyl victims and those who still have related diseases, calling that an issue of "conscience and honor." Prime Minister Mykola Azarov promised better medical treatment, higher pensions and accommodation. In Kiev, an Orthodox priest prayed near a monument to Chernobyl victims in front of hundreds who gathered to pay tribute to those who died. Some in the crowd complained about inadequate compensation and treatment for those who fell ill after taking part in the cleanup. "We lost our town, we lost everything. 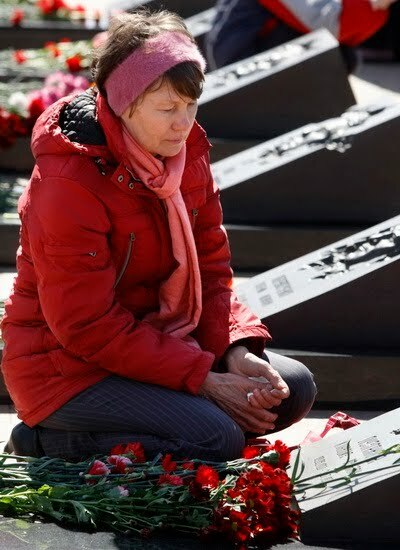 Every time, the authorities promise to raise our pensions, but they always lie," said Serhiy Krasylnikov, a former plant worker who heads a Kiev district union of Chernobyl victims. A commemoration march took place Monday evening in Minsk, the capital of Belarus. In previous years, opposition groups had used unsanctioned commemoration gatherings as a venue for protesting against the authoritarian government. This year, officials sanctioned the march. In Minsk's heavily policed central square, about 2,000 demonstrators held aloft opposition flags bearing slogans such as "Dictatorship is like another Chernobyl," and "You cannot stop radiation with decrees." "(President Alexander) Lukashenko is like a second Chernobyl for Belarus. He doesn't solve the problem, but aggravates it," said Dmitry Rusevich, an 18-year-old student. Their march was due to end with a candlelit vigil by a church dedicated to the victims of the disaster. Independent analysts in Belarus say much is being done to hide the truth about the wider consequences of the disaster. They say contaminated agricultural produce still finds its way onto store shelves.